Manganese was discovered in 1774 by J.G. Grahn in Stockholm, Sweden. Manganese is abundant in the earth's crust (950 ppm) and its principle ore is pyrolusite, a crude form of the dioxide. It is obtained by reduction with aluminum or in a blast furnace. 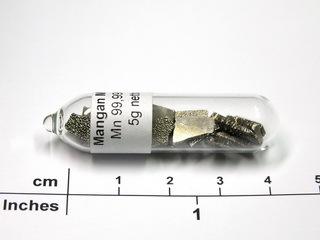 Pure manganese is a hard, brittle, silvery colored, metallic element which exists in three polymorphic forms (alpha, beta and gamma) and has a complicated crystal structure. It resembles iron in being moderately reactive and dissolving in cold, dilute non-oxidising acids. When exposed to air, manganese forms an extremely stable oxide coating which is not easily reduced. 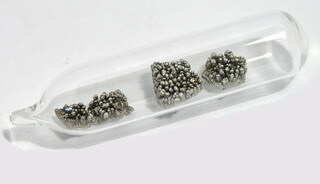 Pure manganese is ferromagnetic after processing. Manganese is not used as the basis of alloys but it is a common constituent of alloys based on other systems, its addition resulting in a significant improvement in the physical and mechanical properties of the resulting alloys. For example, it is present in all steels and cast iron, the concentration being increased for special grades of material; it is also added to certain grades of brass and bronze as well as some nickel and aluminum base alloys. Manganese is also an important element for living beings as manganese deficiency can result in weakened bones and cause them to be easily broken. On average, a human body will contain 12 mg of the element. Manganese 3+ doped glass bead NEW! Manganese 2+ doped fluorescent glass bead NEW!